Diesel Rhino is formulated to be used at regular intervals each time fuel is required. 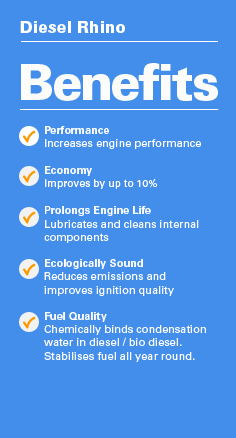 In this way Diesel Rhino delivers long lived and sustained benefits over time. Following initial treatment - Diesel Rhino can be used in a 1:1 ratio. 1ml Diesel Rhino for 1L of fuel, or 10ml Diesel Rhino per 10L of Fuel. INITIAL TREATMENT - Using diesel Rhino for the first time. In order for the product to purge contaminants that have been building over time, we recommend that the following 3-2-1 process be used when using the product for the first time. 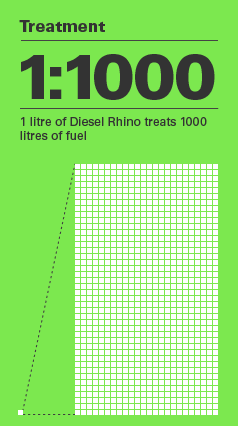 Following initial treatment Diesel Rhino should be used at 1ml per liter of fuel. For a 60L fuel tank 60ml of product is required. For an 80L fuel tank - 80ml of product is required.